Last Friday was particularly exciting for the Piers Park crew. It started off as a day where running around was going to be too much. Friday was so hot and humid. When the day started I was not in the best mood because of the heat, but I still played with the kids and tried to fake my best smile. My mood suddenly changed while we were on the dock. Some kids wanted to pull up a crab trap, so I suggested pulling up the one next to the sail boat. A Harbor Explorer, Anya was pulling up the crab trap, but it got caught on the dock, so I took the line from her and started pulling it up. As it came towards the surface I saw these two big crabs in the crab trap, and I was thinking to myself, wow those crabs are huge. 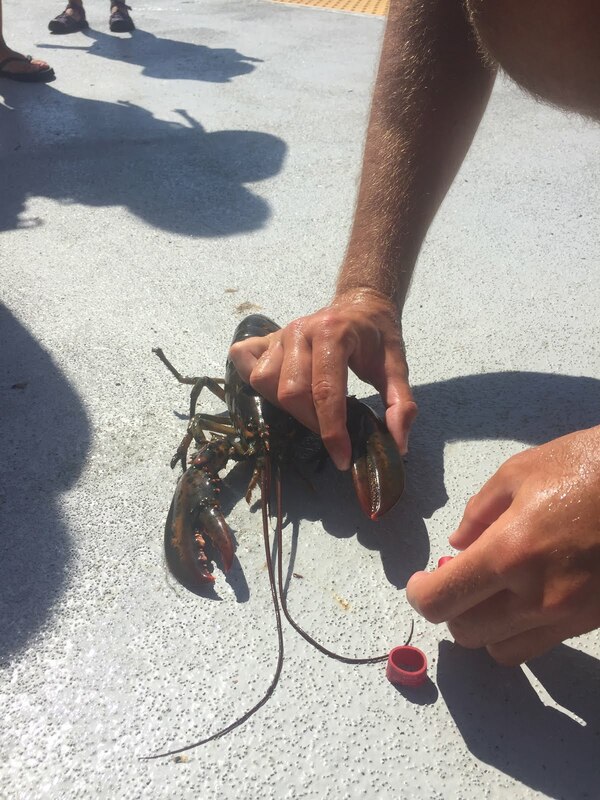 But then as I pulled it all the way up I quickly said "Oh my god we caught two lobsters. SEAN WE CAUGHT TWO LOBSTERS!" Everyone suddenly got super excited. Zach was right next to me on the sail boat and he lost it, he was so happy that he quickly ran to get a bucket to help me put them in some water. Sean was the man who put the rubber bands on their claws. Luckily he did not get pinched, and he admitted that he did not know how to put on these rubber bands. 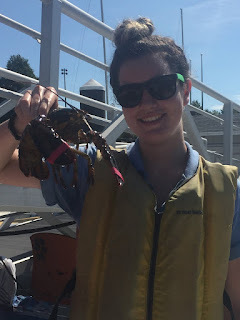 The kids were all so excited, and it was very amazing because it was the first time all summer we caught lobsters, and we did not catch them in the lobster trap either, which is incredible. Our crab traps are very lucky, because about 10 minutes later I heard a kid yelling about how we caught another fish in the crab trap. It was really cool when we put the lobsters back in the water because the bigger one swam away, down and under the dock while the smaller one just kind of slowly sank to the bottom.